Our vision is to give owners of very small businesses and self-employed professionals like accountants, lawyers and architects cutting-edge identity design and marketing support via a supremely simple online platform. While we’re at it, we want to help new entrepreneurs, self-employed professionals and freelance designers learn business skills by sharing our own experience launching and bootstrapping an online company. Most people seem to agree that having a vision for your business before you start is critical. Perhaps that’s why the idea of writing a business plan, even if it’s just one-page long, has become the norm. 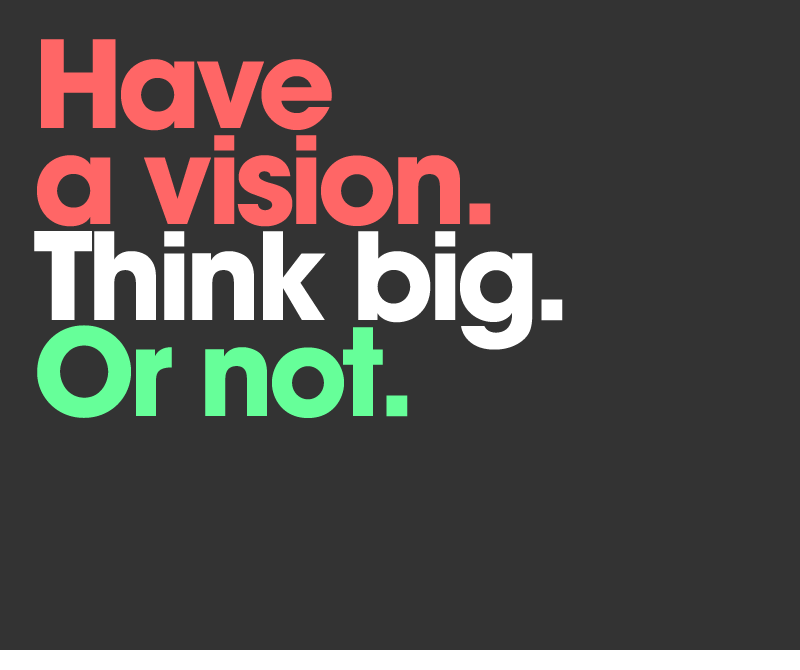 The general wisdom regarding how well-defined and how big your vision should be is mixed, though. A lot of people recommend spending time writing a thorough business plan since it helps you analyze the many aspects of your idea. Other people recommend putting your goals on a sheet of paper and just getting started on your prototype, business or whatever. They argue that ideas and businesses usually change once they get started. At Stylomate, we like both ideas so we’re trying them simultaneously. I am writing a business plan that outlines the particulars of our business and strategy. At the same time, my business partner in Stylomate, David, along with some freelance professionals we have hired, are building the prototype. I’ll let you know over time which approach is working better for us. Right now, both are working. People also seem to disagree about how big your vision for your business should be. Some say “think big.” “Don’t limit yourself.” The idea here seems to be that bigger the goal, the greater the likely results. If you set the bar too low, then you’ll definitely achieve lesser results. The other line of thinking is that your vision should be like Oakham’s razor: very simple. Have a modest, simple idea and go for it. If it grows into a $100 million business great. If not, that’s great too. An exponent of this is Jason Fried, the founder of 37signals, the Software as a Service (SaaS) company that makes online, productivity software like Basecamp. Jason argues that most big businesses started out with modest ambitions and just grew from there: Nike, Starbuck’s, Microsoft and Apple. Again, I think both views are correct. Probably a unifying principle that reconciles the two views is that you shouldn’t try to hard to control the results. Have your idea big or small but don’t be too wedded to a particular outcome. Why? Because ultimately you can’t. There are too many variables in life to be able to control them all. And better yet, providence might have different and better results than you could have dreamed of on your own. In sum, aim high, make a simple plan and enjoy the ride.